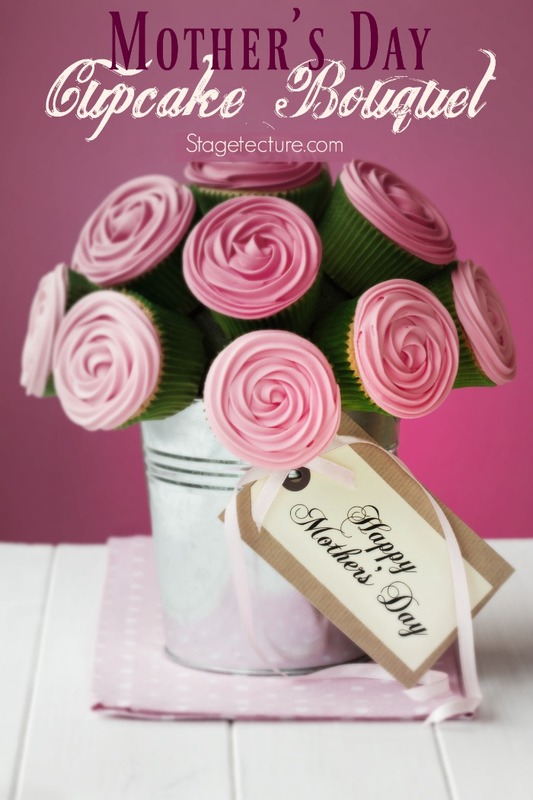 Have you ever wanted to make your mom a cupcake bouquet? Mothers Day ideas are often a challenge to think of but let’s face it – desserts are always welcomed! If you are searching for a thoughtful and original Mother’s Day Gift, try making this beautiful and tasty DIY cupcake bouquet! It will surely create a smile on mom’s face and will be great to accompany her morning or afternoon cup of coffee! Here are the instructions on how to make a Mother’s Day Cupcake Bouquet. Prepare the cupcakes, making sure they don’t have uneven domes (cut a small piece if necessary to create a somehow even surface). Use food coloring to color the frosting. Be sure to have frosting that holds its shape. Using the open star tip and pastry bag, decorate the cupcakes. Pipe a swirl on each cupcake, starting in the center and spiraling out to create a rose-like result. Use other techniques if you want to make other flowers, like sunflowers. Put the cupcakes in the fridge, so the frosting can get firm. Fill the pot with scraps to support the ball, making sure everything fits tightly. You can also add some weight to the pots base, like a rock, so it won’t tip over easily. Insert the ball and attach it to the base’s scraps with wooden skewers, tape or even hot glue. Optional: Cut out a big enough square of tissue paper so to cover the ball and overlap the pot’s edges a little bit. Attach the paper to the ball using skewers or hot glue. Now it’s time to arrange the cupcakes. Begin at the bottom of the ball. Attach each cupcake carefully using two wooden skewers so they won’t twist around. Try to have them at an angle so they won’t fall off. It’s okay to not arrange them perfectly and leave some gaps, since they can be easily covered with tissue paper leaves later on. 5. Tuck folded pieces of tissue paper between the cupcakes to look like leaves. 6. Wrap a ribbon around the pot to give it a final decorative touch. Ready! The cupcake bouquet is tricky to transport it, so be careful while carrying it. Be sure to remove the cupcakes carefully so the pot doesn’t tip over! As an alternative, you can arrange the flower cupcakes on a tablet and decorate them with sugar paste to give them a bouquet – like look! For more dessert ideas on Stagetecture, click here. This is one of the most creative ideas I have seen! I will definitely visit again! Such a cute idea! I love cupcakes. This is one of the most beautiful cupcake bouquets I've ever seen! I love the color scheme! Thanks for linking up with Delicious Dishes Recipe Party! This is such a great idea! I love it! I was looking for ideas on how to showcase cake pops and I think this same concept will work with cake pops just like with the cupcakes. Adorable presentation and ideal as a standalone gift. Great job!